Liberal’s Justin McPhail placed second for the second consecutive season at Newton’s Tournament of Champions. 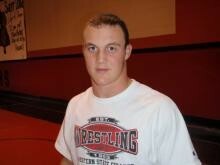 He beat the number one wrestler in 6A from Leavenworth but lost the finals to a Derby wrestler. His weight division (215 pounds) featured the top ranked wrestlers from 6A, 5A, and 4A. Adebayou Braimah and Alejandro Avila both won matches in Newton and wreslted three times. The rest of the Redskins went to Vernon. LHS placed 10th out of 16 team and had five medalists. Cody Smith was second at 130 pounds while Ayodole Braimah (145) took fifth and Dalton Moody (135), Archie Mills (140), and Trent Wilson (152) all placed sixth. Liberal duals at Garden City Thursday and competes at the Rocky Welton Invitational in Garden this weekend.